Time-slot reservations are essential to see The Last Supper while skip-the-line tickets are best to visit many top attractions in Italy including Pompeii, the Uffizi and sights in Rome. Time specific admission tickets are increasingly popular, and in some cases essential, to see some of the top tourist sights in Italy. Prior reservations are essential to see Leonardo Da Vinci’s The Last Supper in Milan while time-slot tickets are a more pleasant way to see top museums including the Uffizi Gallery in Florence and the Vatican Museum. Buy tickets in advance and turn up early to skip lines at sites such as the excavations of Pompeii and Herculaneum near Naples. Guided tours often give fast priority access to sights including St Peter’s Basilica in Rome. Leonardo da Vinci’s The Last Supper may only be seen on advance reservation tickets. Groups get a maximum of 15 minutes with the painting making it absolutely essential to be on time for the reserved time slot period. The ticketing system for The Last Supper is a bit chaotic. Tickets are released in two-month batches and sell our very fast. However, some tickets may be returned by official tour guides so may become available closer to a planned visit. Reservations may be made online at the museum site, telephonically, or enquire at the museum on the day of visit if there are any cancellations. The changes for the latter are remote but if a spot is open, the reservation will be sold. In what seems to be a bit of a racket, guided tours are often available when regular time-slot tickets have sold out. These include a short guided tour and description of the painting but add significantly to the price of admission. Still, at times it is the only way to get admission on a specific date and makes the difference between actually seeing the painting or not. See Buying Tickets to See the Last Supper in Milan for more details. The archaeological site of Pompeii near Naples in Italy is one of the greatest tourist sights in the world. The site is vast, so once inside it is fairly easy to find more quiet areas but it is usually a bit of a scrum at the entrance. A variety of online skip-the-line tickets are available for Pompeii. These tickets – a paper printout is usually required – must still be exchange for a “real” ticket at Pompeii but a special window with fast-moving queue is available. Arriving early at opening time, or actually even better after 15:00 in the afternoon, is still the best way to enter whether with an online ticket, the fantastic deal Campania Arte Card or having to buy a ticket on site. 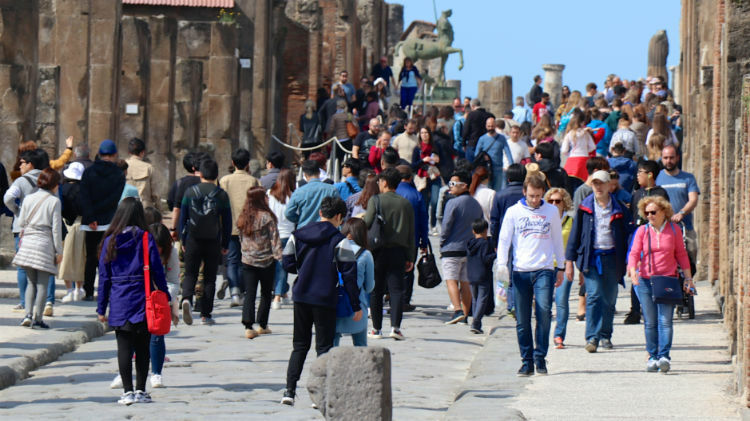 A huge range of guided tours are available and also a good way to enter Pompeii without having to wait in line, or see Herculaneum on the same day. See also Tips on Visiting the Pompeii Excavations near Naples and Buying Tickets and Tours for Pompeii. The excavations of Herculaneum are like the archaeological site of nearby Pompeii best visit early in the morning. Crowds are generally much smaller than at Pompeii but the site itself is also more intimate with only a single ticket gate. Online skip-the-line tickets are a good idea but it may be necessary, quite legitimately, to push in at the front of the regular queue if the special fast-lane counter is closed. As at Pompeii, online tickets and the Campania Arte Card must still be shown at the ticket counter to receive a ticket that will be scanned at the actual entrance gate to the archaeological site. The best time to see the Herculaneum is first thing in the morning or late afternoon. If visiting both Pompeii and the Herculaneum on the same day, see Pompeii first – the site is much bigger than the Herculaneum and has less shade in the middle of the day. Many tours are available to see the Herculaneum with many options including a visit to Pompeii on the same day. See Tips on Buying Tickets and Visiting the Herculaneum near Pompeii for more information and transportation options. See also Skip-the-Line Tickets to Top Sights in Rome such as the Vatican Museum, St Peter’s Basilica and the Coliseum. Time-slot reservations are increasingly necessary for some of the most-popular tourist sights in Europe including for example the Sagrada Familia in Barcelona, the Anne Frank Huis and Van Gogh Museum in Amsterdam, and the free Reichstag dome in Berlin. For sights such as the Alhambra in Granada and the Eiffel Tower in Paris, time-slot tickets are the only sensible way to visit these popular attractions. During the high season, and increasingly year round, time-slot and skip-the-line tickets are a great time saving option worth the slight surcharge.